1 Combine minced chicken, raisins, pistachio nuts, cooked ham chunks, white onion brunoise, all-purpose cream, egg, flour, salt and pepper. 2 Stuff filling into deboned chicken together with quail egg, carrots strips and chorizo de bilbao. 3 Wrap in aluminum foil then roast in oven for one hour or until done. 4 Remove the foil then brush with softened butter. Sprinkle with paprika. Place in salamander until golden brown. 5 Cut into portion size. 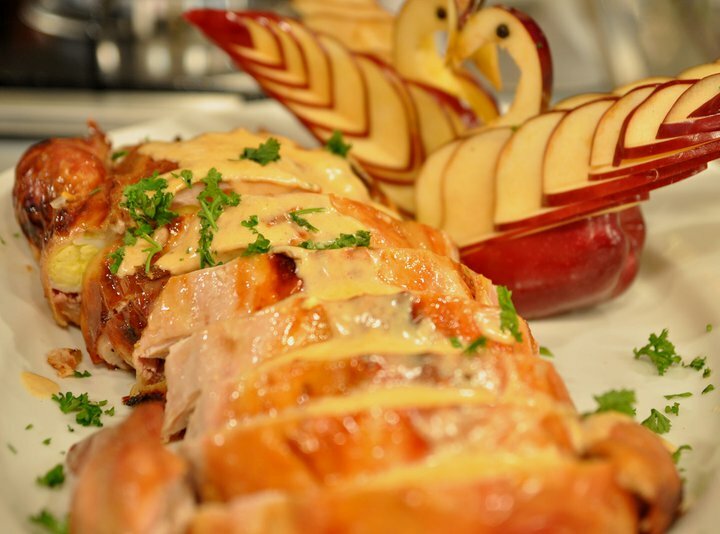 Arrange on plate and garnish with apple swan.